Welcome to RightHear user's guide! This guide will allow you to use our app in a simple and easy way. This user guide is specifically for iPhone users only. In this guide is a detailed explanation of our application and its various options. If you are unable to find answers to your questions – please contact us and we will be happy to assist you! If you haven’t downloaded our app yet, you can download it by scanning the QR code that found here at the right side of the screen, or through the application stores in the links below. The app is free and available for download on Android and iOS. The application does not require an internet connection, but in order for it to work well, you need to turn on the Bluetooth at your phone and enable the location services. The app, however, does require an internet connection when in outdoor mode. You will get to another screen called “Use your location” – here you can choose whether you want to receive notifications about places that are accessible only when you use the app or allow notifications even when it’s open in the background. After this screen, you will come to another screen called “Get Live Updates” – here you can choose to confirm or not to accept updates in real time. From here you will continue to another screen called “Polyglot” (a person who controls multiple languages) where you can choose from your list of languages the languages you want and prioritize them. Two clicks on the “Choose Languages” button will open the list of languages available in the application. In this menu, you can browse through the different languages. To select a desired language from the list, click on it twice. If you want to deselect, repeat the action – stand on the desired language and click twice. To set the order of language prioritization – you need to have a “Reorder” button next to each language in the list. You need to click this button twice and hold. After a few seconds, you will hear a sound and this will be an indication for you that you can drag the language up or down as you wish. Important: Once you have selected the desired languages and order, you must click the “Done” button at the top of the screen on the right to save the changes. in this screen, you can find several buttons that will allow you to orient independently at open or close spaces. Imagine that the screen is divided into three parts: top, middle, and lower. At the top part of the screen, there is a “Current Location” button. 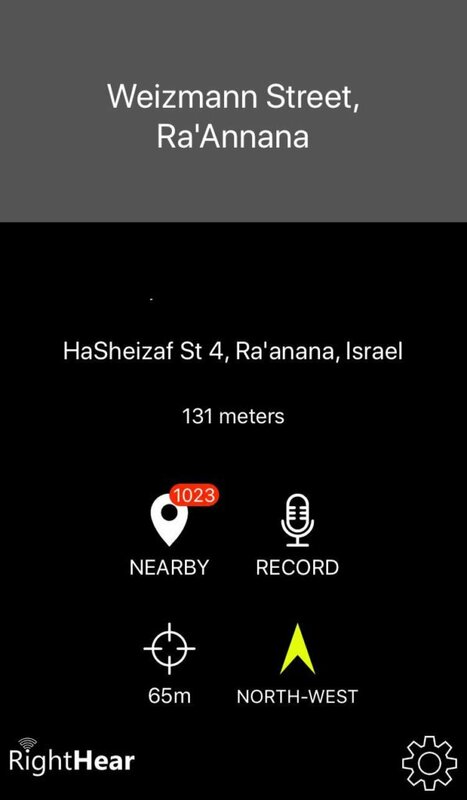 two clicks at this button will allow you to hear where are you (for example: “you are at Weizmann Street, Ra’anana”). At the middle part of the screen, there is an “Around Me” button. Two clicks on this button will allow you to hear what there is around you (for example: “Kfar Saba Junction North”). The bottom part of the screen will change depending on what mode you are (indoor or outdoor). On the bottom-right side of the screen, there is a “Settings” button. to open the settings menu you need to click twice at this button. Also here, the screen is divided into several categories: “Modes” Title – at the top of the screen, you can choose in which mode you want to use the app. 1. “Indoor Mode” button – this mode is relevant for orientation in close spaces (like buildings, organizations) in which our system is embedded. in this situation, the app extracts the information from the sensors installed on the place. 2. “Outdoor Mode” button – this mode is relevant for orientation in open spaces. in this situation, the app extracts the information from an Open source map. 3. “Sky Mode” button – this mode will allow you to know that you are walking in the right direction and don’t deviate from the route. Two clicks at this button will turn on or turn off the sky mode. If you choose to turn on this button – when you tilt your phone to the sky (when it is parallel to your body) you can hear the direction you are going to. 1.“Speech Rate” button – you can choose the speech rate by moving the button left or right. (For those who are using VoiceOver or TalkBack – the speech rate will be set according to the pace of the speech engine). 2.1. 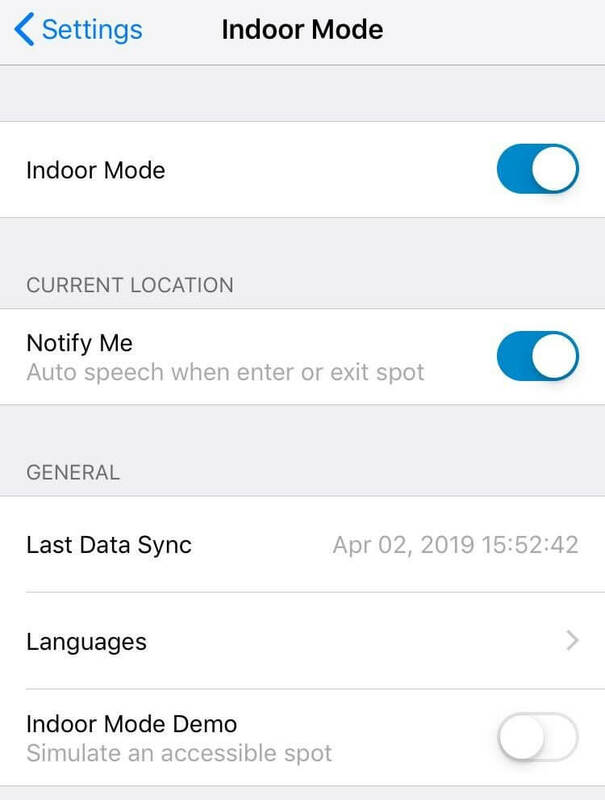 “When Inside Accessible Spot” button – if you choose this option the app will alerts you when you are at accessible spot contains Bluetooth sensor. 2.2. 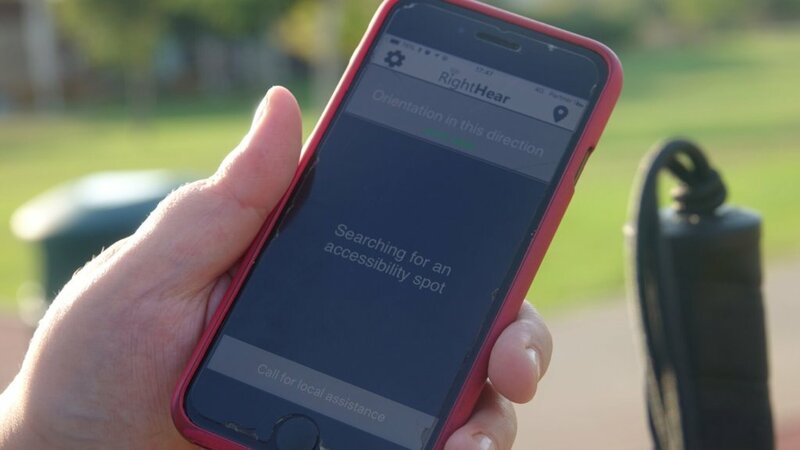 “When Near Accessible Location” button – if you choose this option, the app will alerts you when you are close to accessible location that contains accessible spots. 2.3. “News and Updates” button – if you choose this option you could get news and updates automatically. 2.4. “While app in background” button – if you choose this option, you may get notifications even when the app is in the background or the phone is locked. 1. “Contact Us” button – Two clicks on this button will allow you to send us an email. 2. “Spread The Word” button – Two clicks on this button will allow you to share the app with friends by sending them a link to download the app at any way you will choose (by SMS, WhatsApp, mail and so’). 3. “User Tutorial” button – Two clicks on this button will lead you to the screen with the instructions and explanations that appeared when you first opened the application, which we have listed earlier. Other important information you can find at the bottom of this screen is the version of the app you are using. 1. “Indoor Mode” button – At the top of the screen you can choose to turn on or turn off the indoor mode. 2. “Notify Me” button – the middle part of the screen is referred to a current location (title). 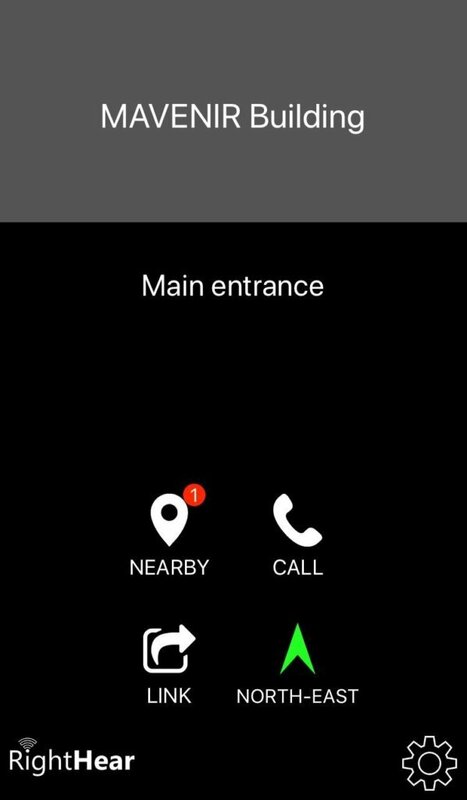 At this part, you can choose to turn on the “notify me” button if you want the app to send alerts automatically when you get in or out from an accessible spot. If you don’t want this – you can leave this button off. 3.1. “Last Data Sync” button – If you stand on this button you can hear when the last data sync. A click on this button will update the data. 3.2. “Languages” button – Here you can select the languages you want and prioritize them, similar to the instructions previously explained. 3.3 “Indoor Mode Demo” button – This button is more relevant to institutions/organizations that considering to implement our solution in their venue and want to experiment with the system. 1. “Nearby Spots” button – a long press on this button will open the list of accessibility points nearby. If you are in a venue which installed more than one accessible spot, the spots will be listed from the closest to the farthest based on your current location. 2. “Call” button – If you need help you can click on this button to call for a local representative. 4. “Direction” button – Two clicks on this button will let you know which direction you are facing (by tilting the mobile device) if the accuracy is not high, you can calibrate the accuracy of the position. You should move the mobile device up, down, and sides as long as the sound is heard until the message is calibrated (if the process is longer, it is recommended to remove external objects from the device such as a cover or magnet). 1. “Outdoor Mode” button – At the top of the screen, you can choose to turn on or turn off the outdoor mode. 2.1. 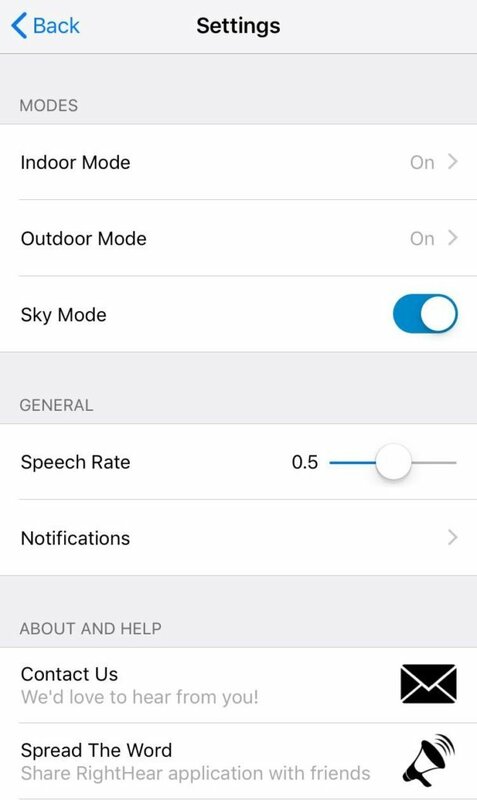 “Notify Me” button – you can activate this button if you want the app to allow automatic speech while you are moving. 2.2.“Distance” button – in this button you can define after how many meters you want the app to alert you where you are. 2.3.“Time” button – in this button you can define after how much time you want the app to alert you where you are. 3.1. “Notify Me” button – you can choose to activate this button if you want the app to alert you about a point of interest while you are in a moving. 3.2. 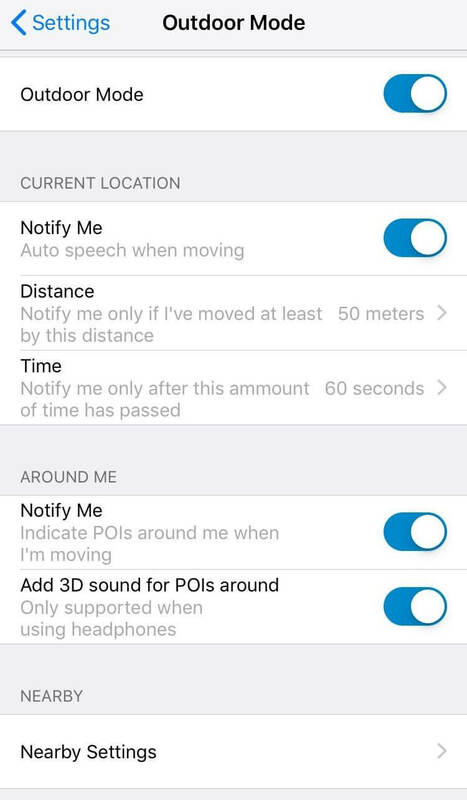 “Add 3D sound for POIs around” button – This option is available only when using headphones. activating this button will allow you to know where the location is – from your right or from your left, according to the ear where the information will be played. 4. The bottom of the screen refers to “Nearby” (title) and here you can change the nearby settings. a. 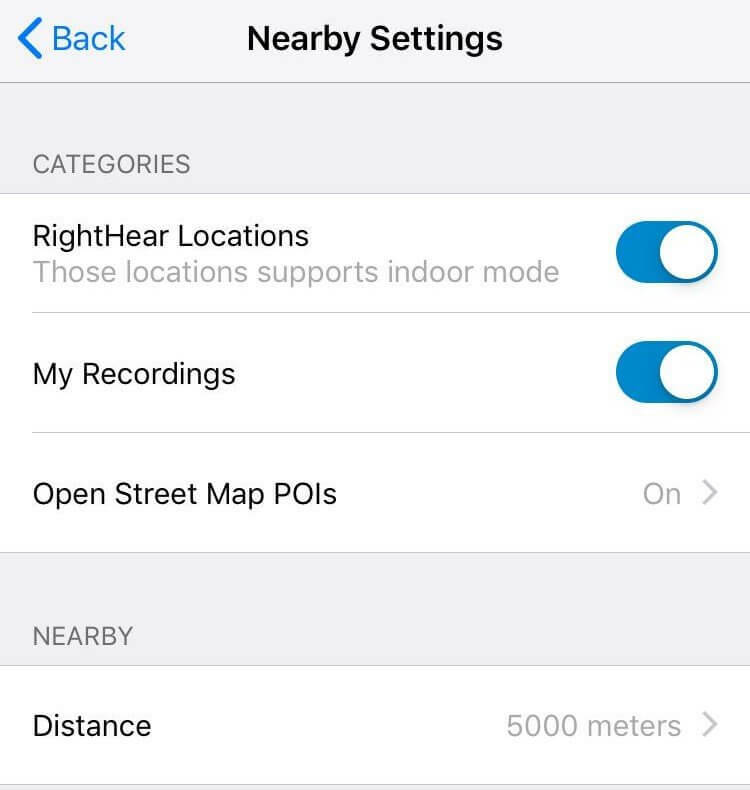 “RightHear Locations” button – If you choose to activate this button, while you use the app at the outdoor mode, except from the open street map OPI’s, the app will show you the list of locations where our system is implemented. If you choose to not activate this button – the list of the RightHear locations will not show when you use the app at the outdoor mode. b. “My Recordings” button – With this button, you can choose whether or not to show your recordings in the list of the nearby locations. c. “Open Street Map POIs” button – If you click this button, a screen with few categories will open. In this screen, you can choose whether you want to see all Open Street Map points of interest, or you want to see only a certain category, such as leisure, sports, tourism, convenience, offices, stores, etc. 5. “Distance” button – This button will allow you to select the distance range you want. The app will show places that have been nested only in the selected range. You can also choose unlimited – in this case, all the OPIs and the accessible locations with righthear in that country will appear. 1.1 “RightHear” button – You can choose this button if you want the app to open the list of the RightHear accessible locations. The order of the places will be from the closest to the farthest from your current location. You can browse the list and when you stand at a certain place – the app will read you the name of the place. 1.1.1. “Simulate Location” button – If you plan to get somewhere you could learn the place before you’ll be there by the simulation mode. Two clicks of this button will open the simulation mode and allow you to experiment the destination.To exit the simulation mode – double click the exit button on the left side of the screen. 1.1.2. “Take Me There” button – Two clicks of this button will open another menu that will ask you how do you want to get to the chosen place. In any choice, the app will lead you to another application that will take you to the desired location. If for example, you want to take a taxi – click on the Gett option, if you want to take a bus – click on the Moovit option and if you want to walk you can click at the option of Google Maps or Maps. 1.2. “Open Street Maps” button – You can choose this button if you want the app to open the OPIs list of Open Street Map. Here also you can browse the list and when you stop at a certain place – the app will read you the name of the place. Two clicks at a certain place will open the “Take me there” menu where you can choose how to get to the desired place. 1.3. “My Recordings” button – click on this button will open your recording list. Here also two clicks will open the “Take me there” menu where you can choose how to get to the desired place. 2. “Record” button – This button allows each user to record specific points of interest. If for example, you are using a permanent bus station, the next time you’ll be there – you can record “my bus station” and save the recording. Once you saved the record, when you will pass at this place, the app will automatically play you the record and then you could know that you are at the place. To record a personal point of interest, press this button twice. After you heard the sound, you can start talking. To end the recording, press on the screen or stop talking. Note: After recording, press the Save button on the top left to save the recording. Pressing this button will open your list of recordings. NOTE: Recording is possible only when the position accuracy is up to 8 meters. 3. “Location deviation” button – This button will give you information about the position deviation so you can know the accuracy. This button can be turned on and off by three clicks. 4. “Direction” button – Two clicks of this button will tell you which direction we are facing (by tilting the device) If the accuracy is not high, we can calibrate the accuracy of the position To open the calibration press the button twice, hold for two seconds and then release. You should move the device up, down, and sides as long as the sound is heard until the message is calibrated (if the process is prolonged, remove external objects from the device such as a cover or magnet). We hope that this users’ guide has helped you understand the app. And if something is still not clear or you have any questions, feel free to contact us and we will be happy to help.